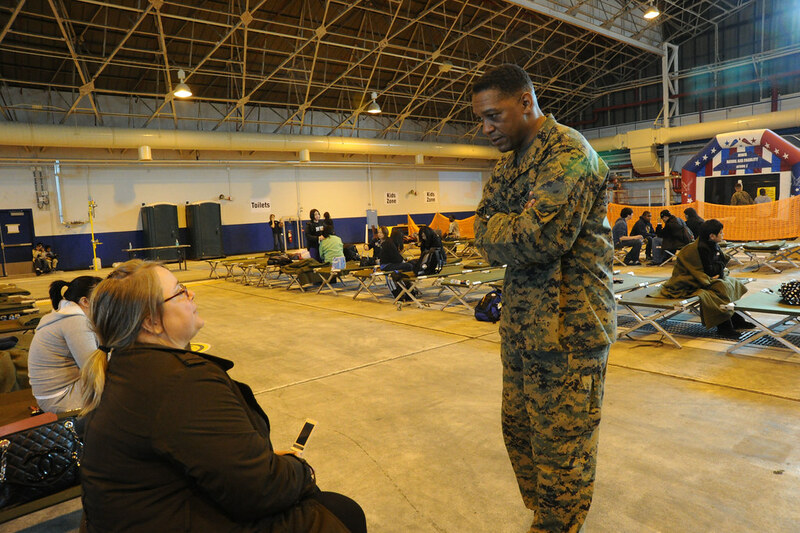 MARINE CORPS BASE CAMP COURTNEY, OKINAWA, Japan - Joint Task Force 505 completed its 25th and final scheduled flight March 28 for Operation Pacific Passage, relocating on a volunteer basis Defense Department families stationed in designated areas of Japan affected by the tragic March 11 earthquake and tsunami. The 111 family members and 15 pets departed Naval Air Facitiy Atsugi were the last to be voluntarily moved on military contracted flights. While the number of families volunteering has shrunk to a trickle, the Operation continues and future authorized departures will be arranged through commercial travel offices. On March 17, the office of the under secretary of defense authorized DoD eligible family members located in selected prefectures on the island of Honshu, Japan, to voluntarily depart for designated locations of the United States and other designated safe haven locations. To date, more than 7,400 eligible family members have temporarily relocated, along with 409 family pets. Joint Task Force 505 is headquartered on Okinawa with a forward operating element at Yokota Air Base near Tokyo.